We all watched in admiration as “Good Morning America” host Robin Roberts returned to the set five months after having undergone a bone marrow transplant. During the height of her career, Roberts found out she had myelodysplastic syndrome, MDS, a rare blood and bone marrow disease. Roberts said the disease was once called “pre-leukemia,â€ and is a complication from the treatment she received to beat breast cancer in 2007. The key to success: Claiming, imagining, creating and manifesting your vision. Roberts described how a fan of the show sent her a vision board that included words and images pertaining to healing. The vision board reminded Roberts that her body was healing, and it helped her to remain positive and focused on the outcome she wanted. In order to succeed in your professional life, creating a vision board will help you to visualize the big picture and future goals even when the road gets rough. No matter what, seeing the glass half full goes more than a long way. “I’ve been living with this diagnosis for a while and will continue to anchor GMA. Along with my faith, family and friends, all of you at ABC News give me the motivation and energy to face this challenge,” Roberts said during one of her hospital visits. Surrounding yourself with positive people and having an optimistic attitude will help build your self-confidence. Positive family members, friends and coworkers can help you realize your dream and help conquer your fears. There’s also a reciprocity in putting out positive thoughts and actions wherever you are. When the going gets rough, giving up should not be an option. When Roberts announced she had the disease, she told viewers through tears: “Bottom line: I am going to beat this. My doctors say it and my faith says it to me.â€ Having a determined attitude will help you to maintain professionalism and composure even in the face of adversity. Having determination makes you stand out from the crowd, gives a strong sense of trust and authority, and puts you on the road to a successful career. 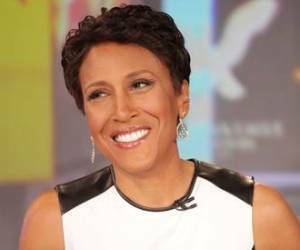 What career lessons have you learned from Robin Roberts? #SoundOff and follow Jamie on Twitter @JayNHarrison.